Compare funeral directors in Motherwell and read verified reviews on the UK’s online funeral resource. Use Funeral Zone Listings to find local funeral directors in Motherwell that meet your specific needs. You can organise the search results by ‘best rated’, 'nearest' or ‘most reviewed’. There is also a handy Google Maps feature so you can see exactly where each funeral home is in relation to each other. 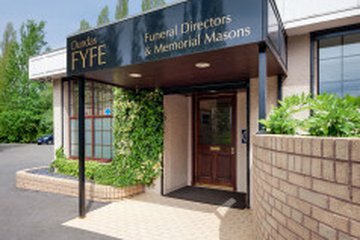 The staff at Dundas Fyfe Motherwell were excellent and helpful. 1st class service from Sam, Andrew and team. Would recommend to anyone. Professional, caring and empathetic. Andy, Sam and Alison went above and beyond in easing the burden of a very emotional time for our family and we can't thank them enough. Excellent and professional service. Everything was taken care of and I was very confident in the staff and the service that they offer. This is the second time that we have used Dundas Fyfe and I would not hesitate to recommend them.